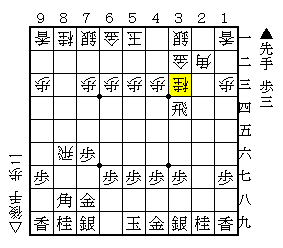 Side Pawn Picker (Yokofudori in Japanese) is one of the most popular strategies among pro players, but, amateur players don't really prefer it. I suppose this is because Side Pawn Picker tends to be an aerial battle (called like this) which major pieces act dynamically around the middle ranks without advancing generals. It may look complicated. First of all, gote here must pay attention to sente's threat. If △Rx76 is played as well, with ▲Bx22+, the game will be over immediately. From Diag.1, gote has several ways to go for strategies. △N-33 had been the fashion in the past. 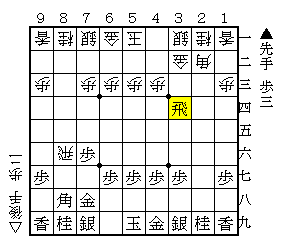 The concept of this move is to bring the king to the right side such as △K-62, △K-72 or △K-62, △S-72, △K-71 (△K-52 is also selectable), and the disadvantage is to stop the bishop's path. Depending on the situation, The knight on 33 will jump to attack. For example, if sente plays ▲R-24 here, △N-45 would occur. ▲K-58 would get into trouble with △Bx88+, ▲Sx, △B*33 (Diag.3). Gote almost win already. When △N-45, ▲R-25 has been played in pro games. After that, a slashing sequence continues with △Nx57+, ▲Rx22+, △Sx, ▲B*24, △K-52, ▲Bx57, △R*27, ▲P*28, △R-25+ (Diag.3). In spite of gaining a knight, it's still an equal game as the promoted rook has great influence on the board. 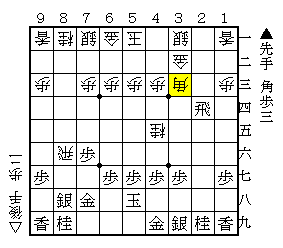 If sente wants to avoid this variation, the rook should pull back to 36. 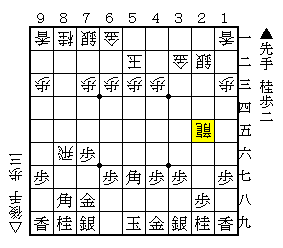 ▲R-36 or ▲K-58 is the common move here. And, when ▲R-24, △P-14 is also selectable for gote to go into a slow game.